Set your course. Fly at the enemy. Take aim, and fire! 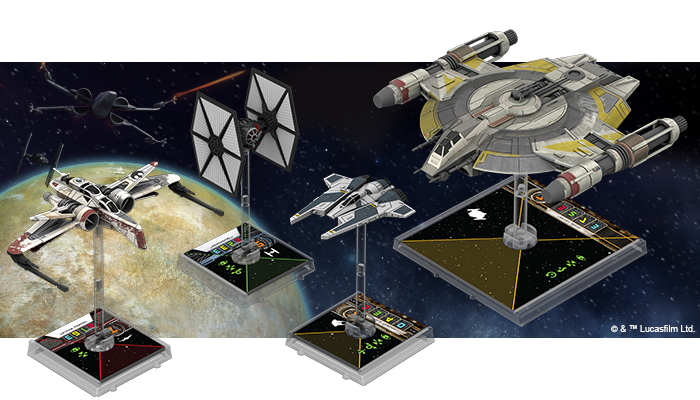 Fantasy Flight Games is proud to announce the upcoming release of four new Wave IX starship expansions for X-Wing™! Even as Wave IX introduces a wealth of starfighters and pilots taken from The Force Awakens, Star Wars Rebels, and the new canon, it reinforces the game's emphasis on skillful maneuvering and the importance of catching your enemies squarely in your firing arc. Between these four expansions, you will find zero turrets. Instead, you will find two auxiliary firing arcs, one mobile firing arc, and a starfighter with zero shields… whose pilots practice flying straight at their foes. And there is plenty more to this wave than just its ships. You will also meet Poe's mother, discover new First Order tech, welcome a handful of Mandalorians to the Scum faction, and gain the ability to fly Sabine Wren as a Scum bounty hunter. The ARC-170 Expansion Pack introduces this starfighter to X-Wing as a somewhat sluggish vessel with six hull, three shields, and one agility. It flies well at slower speeds, but struggles at higher speeds, featuring six green maneuvers at speeds "1" and "2," even while four of its seven higher-speed maneuvers are red. Meanwhile, as with all the ships in Wave IX, the ARC-170 rewards you for catching your foes within its firing arc, even if that arc is its auxiliary arc. 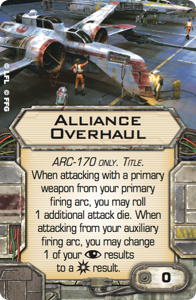 Even though the ARC-170's primary weapon boasts an unmodified value of just "2," you can give it an Alliance Overhaul to boost its attacks from its primary firing arc by one die or to change one result to a whenever you perform an attack from its auxiliary firing arc. 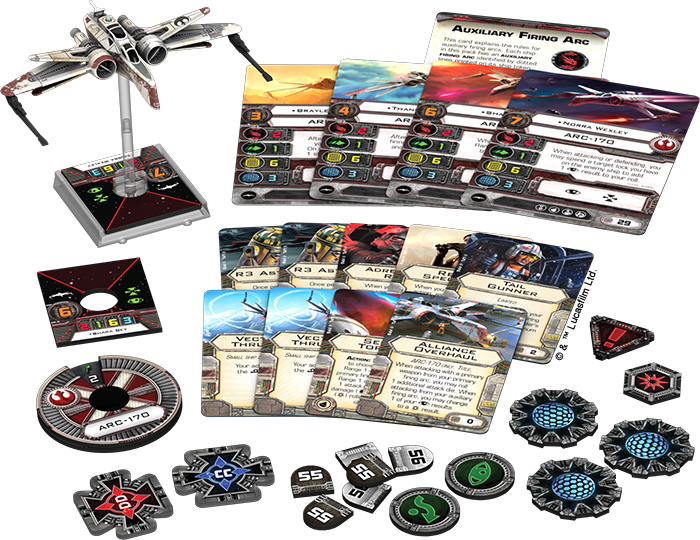 Additionally, the expansion comes with four ship cards that introduce four new aces, including Poe Dameron's mother Shara Bey , who flew as Green Four during the Battle of Endor. Its nine new upgrades allow you to take advantage of the unique pairing of crew and astromech upgrade slots. Only the First Order's most elite pilots were authorized to fly this specialized two-seater TIE craft. Outfitted with enhanced shields, weapons, and sensor systems, each Special Forces TIE fighter had a dual heavy laser turret mounted to the bottom of its fuselage. In conjunction with a warhead launcher, this turret made the fighter's weapons far more threatening than the standard TIE/fo fighter's and granted the ship an extra measure of defense against threats to its rear. Although it looks almost identical to the TIE/fo fighter, the Special Forces TIE is an entirely different vessel, trading away a point of agility in favor of two extra points of shields, and boasting an entirely different maneuver dial. Moreover, while both ships feature a primary attack value of "2," the comparison between the two ships' offensive capabilities quickly breaks down. First of all, the Special Forces TIE can equip a missile upgrade. Then, more importantly, the Special Forces TIE can equip the Special Ops Training Title for free. Like the Alliance Overhaul for the ARC-170, this upgrade allows you to add an attack die to any attack you make from your primary firing arc. On the other hand, if you choose to forsake the extra attack die, your Special Ops Training makes it possible for you to take shots from both your primary and auxiliary firing arcs in the same round. To ensure that your squad benefits as much as possible from your Special Forces TIE and Special Ops Training, the Special Forces TIE Expansion Pack introduces four new pilots, including two unique aces, and five upgrades. 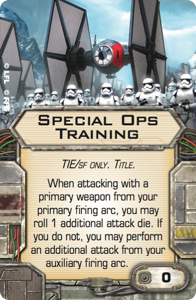 Notably, since the Special Forces TIE features slots for both a systems and tech upgrades, you will find new cards for both these slots included in the pack. Also known as the "Fang fighter," the Concord Dawn Protectorate starfighter was a fast and sleek Mandalorian vessel custom-built for fighter combat. Equipped with a hidden torpedo launcher and pivot wings that provided vector thrust control, the Protectorate starfighter lent itself well to its pilots' aggressive approaches. They leveraged their ship's unmatched agility and narrow attack profile to execute the deadly head-on charges of the Concordia Face Off maneuver. Pulled from Star Wars Rebels and the pages of Star Wars: Kanan, the Protectorate starfighter enters X-Wing as one of the most potent—and most deceptively simple—vessels in the Scum and Villainy fleet. It boasts a healthy and aggressive stat line of three attack, three agility, and four hull, and it grants its pilots access to the focus, target lock, barrel roll, and boost actions. 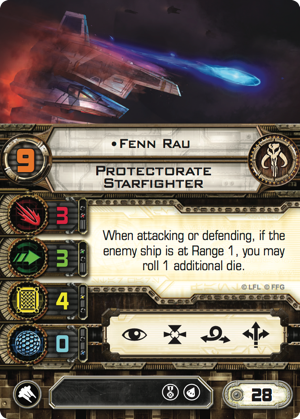 But while the ship's range of actions and maneuver dial, combined with its lack of shields, suggest that it should be a classic arc-dodger in the vein of the A-wing and the TIE interceptor, its pilots, like Fenn Rau , tend to favor brash, head-on charges. Accordingly, among the expansion's six ship cards and two upgrades, you will find no fewer than four cards that reference "Range 1," and three that reward you for flying straight into your opponent's firing arc. The signature starship of the young and ambitious bounty hunter Ketsu Onyo, the Shadow Caster was agile and powerful, but lightly shielded, trading heavy ray shielding for speed. In addition to its laser cannons and swivel-mounted, pilot-operated turret, the craft was equipped with a powerful multi-directional tractor beam. Both the Shadow Caster and Ketsu Onyo make their way from Star Wars Rebels to X-Wing with the Shadow Caster Expansion Pack. 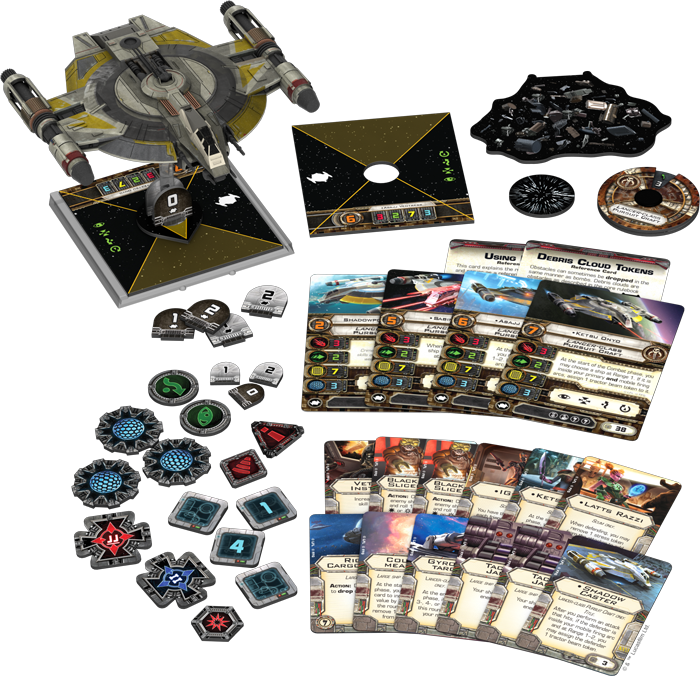 They arrive to the Scum and Villainy faction along with four ship cards and twelve upgrades that afford you myriad options for outfitting your Shadow Caster with different crew and illicit upgrade combinations. 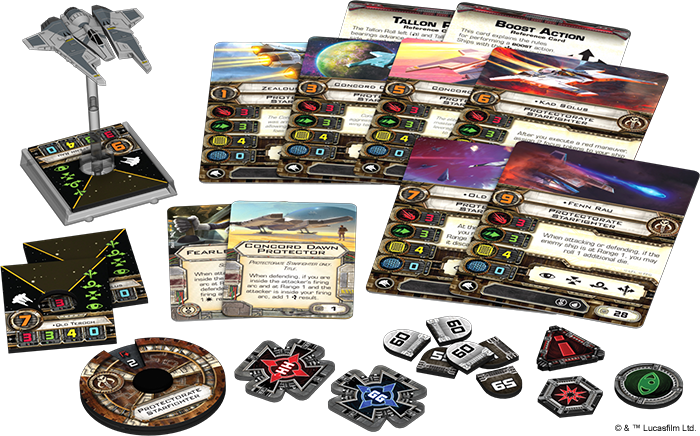 Importantly, the Shadow Caster Expansion Pack also introduces some new rules and possibilities to your X-Wing battles. Instead of a full 360-degree turret, the expansion's Lancer-class pursuit craft comes with a mobile firing arc. Indicated by a token that lays over the ship's base, this mobile firing arc can occupy any of the four quadrants indicated on the ship's base, and a pilot can use the rotate arc action to move it to any other quadrant. 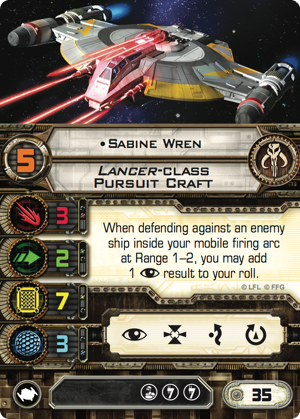 This affords the Shadow Caster some of the advantages of a turret even while preserving a distinctive—and more point-efficient—playstyle, and as you might expect, each of the expansion's three unique pilots can put this mobile firing arc to good use, including the new Scum version of Sabine Wren . Additionally, the Shadow Caster Expansion Pack and its upgrades allow you to litter the battlefield with debris tokens, upgrade your Shadow Caster with the abilities of each IG-2000 in your squad, and force your opponents to suffer the lingering effect of tractor beam tokens that are not removed during the end phase. In other words, the expansion is going to ensure the Scum faction stays updated with all the most devious tricks. "This is gonna be fun. Very fun." Will Wave IX and its starship expansions prove to be the perfect balance of innovation and classic design? 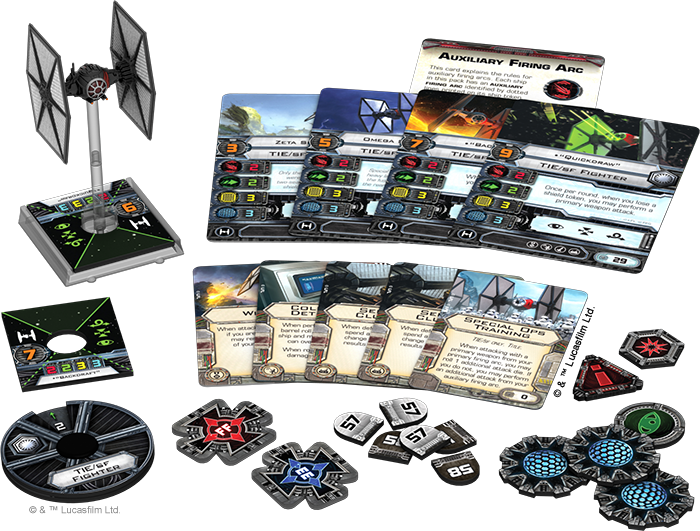 Only time will tell, but for now, we know that it promises to add plenty of excitement through its variety, even as it keeps your X-Wing dogfights squarely focused on the basic principles of maneuvering, aiming, and firing. Auxiliary firing arcs. Mobile firing arcs. Ships that want to fly into their enemies' firing arcs. Ordnance and upgrades that can literally change the shape of the battlefield. New aces pulled from the expanded Star Wars canon. Wave IX is coming, and there is only one good way to meet it—head on. Look for Wave IX and its expansions to arrive at retailers late in the third quarter of 2016. 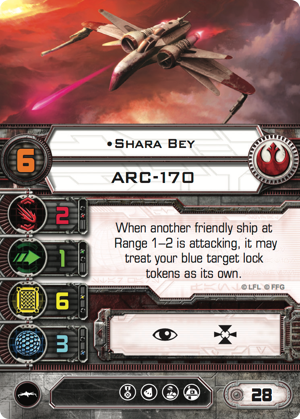 Until then, keep your eyes open for more previews and other X-Wing news!